← MISSING BOSTON TERRIER fwom Houston, Texas! Momma Maggie an us babyz! I iz bewy essited to share da gud nooz I haz weceebed! Welp, mai barkday iz coming up soon an I tolded Momma dat I ben wunnerin’ abowt mai Boston Terriah pawentz wately. mai sibfurz, BOL! An da bootyfull Lady Boston…DAT iz mai Momma Maggie! Apawently, I haz meny ob her mannawizmz an I awso wook bewy much wike mai doggeh Mommy. Da totawwy pawsome an essiting nooz iz dat Momma Maggie an Papa Max still wiv cwose by an dey keeped mai seester Missy an mai brudder Owiber!!!! I GUNNA GET TO WEUNITE WIF MAI DOGGEH FAMIWEE!!!!! I not noze WHO iz more essitedz, ME owa Mommy!!! mai rap moozik an I weely hopingz dat dey wiked all ob it! I keep finkin’ abowt da moment owa eyebaldz meet…. Will dey weccanize me? Will dey fink I’z pwetty??? Will mai seester Missy be skinnier den me??? I haz SOOOOO menny qweshunz! I shud stawt gettin’ weddy NOW..hmmm…gottzta pick da pawfect scawf….get mai nailz painted….gotta gettz mai fur-do……….. 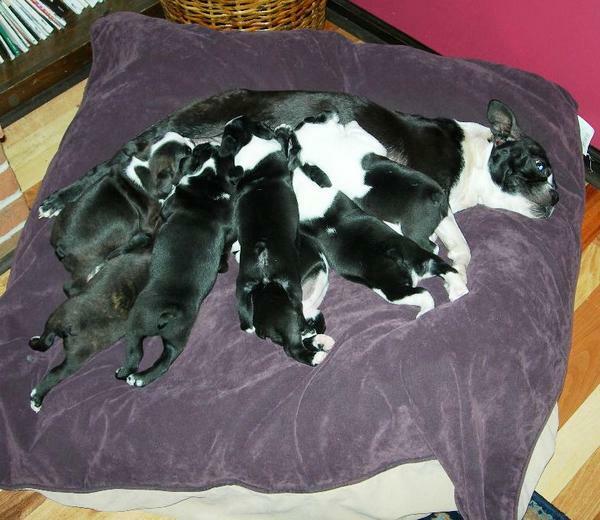 This entry was posted in Uncategorized and tagged Boston Terrier, Boston Terriers, dogs, P-Jiggy, Paloma. Bookmark the permalink. Why oh why can’t you move to San Diego so you can photograph my kids!! Your work is aboetulsly amazing and this newborn is the cutest! I love the variety and the richness to these. Simply gorgeous as usual!!! Loma, you’re straddling one of your siblings! You must have been HUNGRY! When will you get to see your doggy family? That’s super exciting! I bet they recognize you from your scent. And of course they will think you are beautiful! DUH! I bet they will want your paw-digraph!